JuiicyScoop: Bald Hair, I don't Care! Bald Hair, I don't Care! I know that line came from a song but I can't remember which. 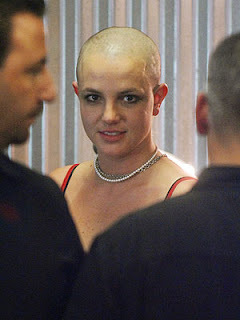 Our pop princess Britney Spears , fresh out of re-hab, sported a new "bald" do. She has a pretty cranium. Only thing I have a problem with here is the line "fresh out of rehab" implying she actually stayed and went throught the whole process when in all reality she couldn't take it and left after one day. BUT hey maybe she's a fast healer and it only took her 1 day to kick the habit that it takes others months and years to kick. This girl has completely lost her mind.